Hindustani (Hindustani: हिन्दुस्तानी, ہندوستانی), historically also known as Hindavi, Dehlvi, Urdu, and Rekhta, is the lingua franca of North India and Pakistan. It is an Indo-Aryan language, deriving primarily from the Khariboli dialect of Delhi, and incorporates a large amount of vocabulary from Persian, Arabic, Sanskrit and Chagatai. It is a pluricentric language, with two official forms, Modern Standard Hindi and Modern Standard Urdu, which are its standardised registers, and which may be called Hindi-Urdu when taken together. The colloquial languages are all but indistinguishable, and even though the official standards are nearly identical in grammar, they differ in literary conventions and in academic and technical vocabulary, with Urdu retaining stronger Persian, Central Asian and Arabic influences, and Hindi relying more heavily on Sanskrit. Before the Partition of India, the terms Hindustani, Urdu, and Hindi were synonymous; all covered what would be called Urdu and Hindi today. 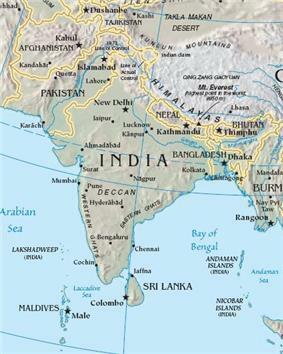 The term Hindustani is still used for the colloquial language and lingua franca of North India and Pakistan, for example for the language of Bollywood films, as well as for several quite different varieties of Hindi spoken outside the Subcontinent, such as Fiji Hindi and the Caribbean Hindustani of Suriname and Trinidad. Early forms of present day Hindustani emerged from the Middle Indo-Aryan apabhramsha vernaculars of North India in the 7th–13th centuries CE. Amir Khusro, who lived in the 13th century CE during the Delhi Sultanate period in North India, used these forms (which was the lingua franca of the period) in his writings and referred to it as Hindavi. The Delhi Sultanate, which comprised several Turkic and Afghan dynasties that ruled from Delhi, was succeeded by the Mughal Empire in 1526. Although the Mughals were of Timurid (Gurkānī) Turko-Mongol descent, they were Persianized, and Persian had gradually become the state language of the Mughal empire after Babur. In the 18th century, towards the end of the Mughal period, with the fragmentation of the empire and the elite system, a variant of Khariboli, one of the successors of apabhramsha vernaculars at Delhi, and nearby cities, came to gradually replace Persian as the lingua franca among the educated elite upper class particularly in northern India, though Persian still retained much of its pre-eminence. 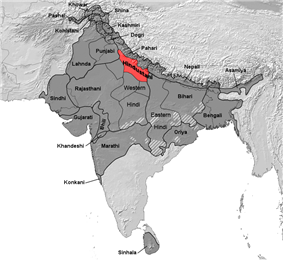 The term Hindustani (literally "of Hindustan") was the name given to that variant of Khariboli. As an emerging common dialect, Hindustani absorbed large numbers of Persian, Arabic, and Turkic words, and as Mughal conquests grew it spread as a lingua franca across much of northern India. 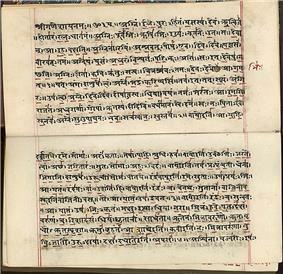 Written in the Perso-Arabic Script or Devanagari script, it remained the primary lingua franca of northern India for the next four centuries (although it varied significantly in vocabulary depending on the local language) and achieved the status of a literary language, alongside Persian, in Muslim courts. Its development was centred on the poets of the Mughal courts of cities in Uttar Pradesh and Punjab such as Delhi, Lucknow, Lahore, and Agra. Urdu is the national language of Pakistan and an officially recognised regional language of India. It is also an official language in the Indian states of Andhra Pradesh, Telangana, Jammu and Kashmir, National Capital Territory of Delhi, Uttar Pradesh, Bihar and West Bengal that have significant Muslim populations. Hindi, a major standardised register of Hindustani, is declared by the Constitution of India as the "official language (rājabhāshā) of the Union" (Art. 343(1)) (In this context, 'Union' means the Federal Government and not the entire country - India has 23 official languages). At the same time, however, the definitive text of Federal laws is officially the English text and proceedings in the higher appellate courts must be conducted in English. 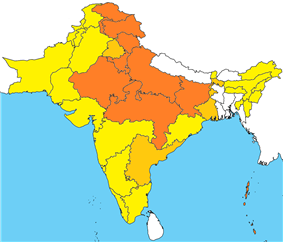 At the state level, Hindi is one of the official language in 9 of the 28 Indian states and three Union Territories (namely Uttar Pradesh, Bihar, Jharkhand, Uttarakhand, Madhya Pradesh, Rajasthan, Chhattisgarh, Himachal Pradesh, and Haryana and UTs are Delhi, Chandigarh, Andaman and Nicobar Islands). In the remaining states Hindi is not an official language. In the state of Tamil Nadu studying Hindi is not compulsory in the state curriculum. However an option to take the same as second or third language does exist. In many other states, studying Hindi is usually compulsory in the school curriculum as a third language (the first two languages being the state's official language and English), though the intensiveness of Hindi in the curriculum varies. Urdu, also a major standardised register of Hindustani, is also one of the languages recognised by the Indian Constitution and is an official language of the Indian states of Andhra Pradesh, Bihar, Delhi, Jammu and Kashmir, and Uttar Pradesh, Urdu has official language status. Although the government school system in most other states emphasises Modern Standard Hindi, at universities in cities such as Lucknow, Aligarh and Hyderabad, Urdu is spoken and learnt, and Saaf Urdu is treated with just as much respect as Shuddha Hindi. Besides being the lingua franca of South Asia in India and Pakistan, Hindustani is spoken among the South Asian diaspora and their descendants in North America, South America, the Caribbean, Europe, Africa, and the Middle East. Similarly, Caribbean Hindustani is actually Bhojpuri and is spoken in Suriname, Guyana, Trinidad and Tobago, and Belize. Sarnami Hindi is the third most spoken language in Suriname after Dutch and Sranan Tongo. This is due to the emigration of East Indians (known locally as Hindoestanen in Suriname) from the Indian states of Bihar and Uttar Pradesh in North India. Ethnic Indians form 37% of the population in Suriname. Ethnic Indians also make up around 45% of Guyana's population, the largest ethnic group there, but unlike in Suriname they have mostly switched from Bhojpuri to English. In South Africa, Kenya and other parts of Africa, older descendants of 18th century sugar cane workers also speak a variety of Bhojpuri as their second language. Because of anglicisation in South Asia and the international use of the Latin script, Hindustani is occasionally written in the Latin script. This adaptation is called Roman Urdu or Romanised Hindi, depending upon the register used. Because the Bollywood film industry is a major proponent of the Latin script, the use of Latin script to write in Hindi and Urdu is growing amongst younger Internet users. Because Urdu and Hindi are mutually intelligible when spoken, Romanised Hindi and Roman Urdu are as well, unlike Devanagari Hindi and Urdu in the Urdu alphabet, which use different writing systems that are not mutually intelligible. ^ Hindūstānī IPA: , literally: "of Hindustan"
^ 120 million Standard Hindi (1999), 45 million Urdu (1999). Ethnologue 16. ^ Nordhoff, Sebastian; Hammarström, Harald; Forkel, Robert; Haspelmath, Martin, eds. (2013). "Hindustani". Glottolog 2.2. Leipzig: Max Planck Institute for Evolutionary Anthropology. ^  Indika: the country and the people of India and Ceylon By John Fletcher Hurst (1891) Page 344. ^ "The Origin and Growth of Urdu Language". Yaser Amri. Retrieved 2007-01-08. ^ a b c d Faruqi, Shamsur Rahman (2003), "A Long History of Urdu Literarature, Part 1", Literary cultures in history: reconstructions from South Asia, p. 806, in Pollock (2003). ^ Grierson, vol. 9-1, p. 47. ^ Government of India: National Policy on Education. ^ "Colonial Knowledge and the Fate of Hindustani".